On May 18, 2017, Jason Chaffetz (R-UT) announced he would be stepping down from his position as the Congressional Representative for Utah’s 3rd District on June 30, 2017. As a result, a special election will be held on November 7, 2017, to fill his seat. In this article, I’ll break down the field of Utah special election candidates and discuss who has the best chance of becoming the district’s next House Representative. The Utah special election candidates are listed below by party affiliation in alphabetical order. On August 15, the three Republican candidates will face off in a primary to determine who will represent the party in November. It’s the first time in history that three or more candidates will be on ballot in a primary for Utah’s 3rd district. Kathie Allen is a doctor who once served as a Congressional Aid for Shirley Pettis. Allen decided to put off retirement and focus on politics after Donald Trump, a man who she has been strongly critical of, was elected President in 2016. On her campaign website, Allen states that she supports the Affordable Care Act, public financing of political campaigns, and increasing the minimum wage. Tanner Ainge, the son of Boston Celtics General Manager Danny Ainge, made his way onto the ballot by gathering 9,000 signatures, 2,000 more than the necessary 7,000, in support of his candidacy. Per his campaign website, Tanner Ainge calls him a “conservative Republican” whose platform includes balancing the federal budget, lowering taxes, repealing the Affordable Care Act, and upholding the Second Amendment. 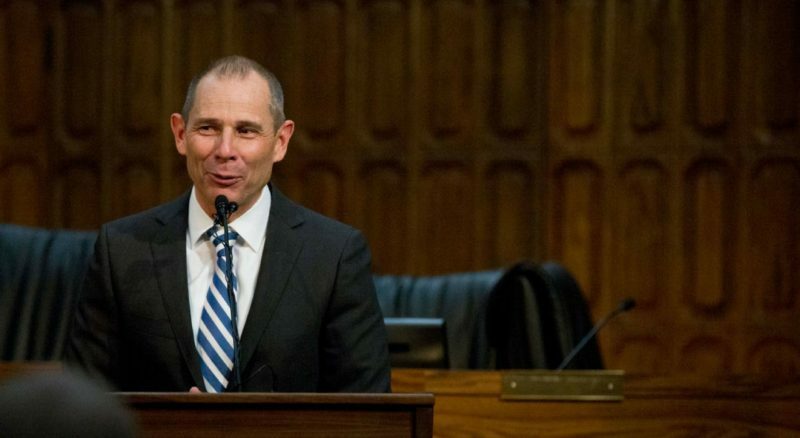 John Curtis, the mayor of Provo, Utah, also made his way onto the ballot by collecting more than 15,000 signatures in the support of his candidacy. Before becoming mayor in 2010, he ran for Utah State Senate in 2000, losing to Curt Bramble. Curtis currently has a fundraising advantage over his primary opponents, raising over $132,000 from 368 donors from the months of April through June. Christopher Herrod is a former House Representative who served the state’s 62nd district from 2007-2012. He also served as Utah’s state leader in the American Legislative Exchange Council. Herrod won 55% of the vote to defeat Deidre Henderson to win the Republican Party’s convention nomination for the UT-03 special election. It’s important to note that Herrod was selected by party delegates and was not nominated after winning a vote of registered voters. According to his campaign website, Herrod supports simplifying the tax code and abolishing the IRS, repealing the Affordable Care Act, and bringing an end to net neutrality. Herrod has been endorsed by Kentucky Senator Rand Paul (R). Representing the Libertarian Party is Joe Buchman, the current Chair of the Utah Libertarian Party. According to his campaign website, Buchman strongly supports the Libertarian Party platform, which includes drug legalization, non-interventionism, and major tax reform. You can learn more about Jason Christensen on his campaign website. Sean Whalen will be running as an independent candidate, unaffiliated with any political party. He got on the ballot by collecting more than the minimum of 300 signatures from registered voters in Utah’s 3rd district. Though he’s running as an independent, his platform, which you can read on his campaign website, aligns much with the Republican candidates in this race. *Indicates that the candidate is still in the running to win Utah’s special election. Who Will Win The Utah Special Election? Considering that Utah is perhaps the most conservative state in the union, it’s essentially a foregone conclusion that the winner of the Republican primary will win the general Utah special election. On August 15, John Curtis won the Republican primary, receiving more than 42% of the vote. Herrod finished with 31% and Ainge finished with 26.9%. We’ll keep you updated on the Utah special election candidates as the race continues to unfold. Feel free to leave a comment down below to discuss the state of this race! ONR has not, and will not, endorse a candidate in this race. Links to campaign websites are not endorsements.